Spot the Differences! 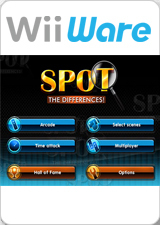 : the ultimate "spot the difference" game on the WiiWare service with 160 scenes, three levels of difficulty, and 1,600 differences to spot! Play either solo or with friends (up to four players) to find out who's the best spotter! Browse through odd and attractive scenes on various categories: Landscapes, Pets, Playtime and Yummy! The graph below charts the compatibility with Spot the Differences! since Dolphin's 2.0 release, listing revisions only where a compatibility change occurred. This page was last edited on 15 January 2018, at 04:34.